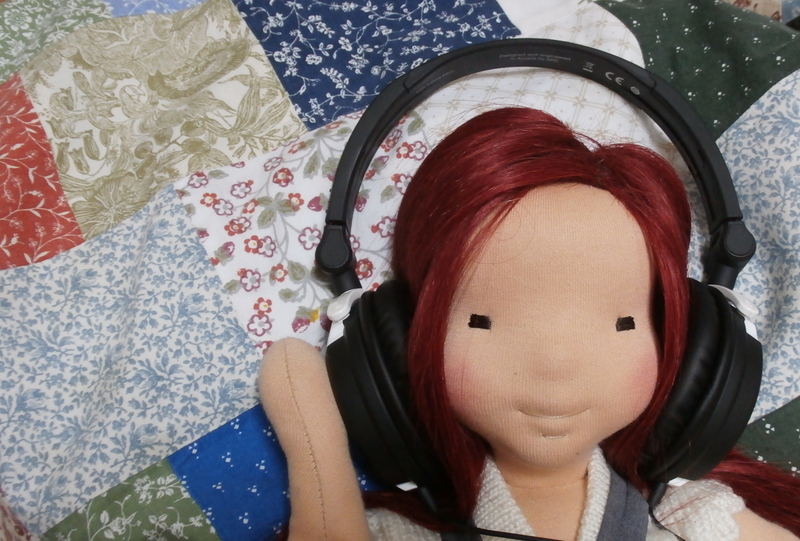 Here’s my next doll again from the same pattern line which I have decided to call ‘Popi’ dolls. ‘Popi’ is Genovese dialect meaning small (often round, soft and squishy) children. My husband is often calling our children collectively ‘Popi’ even though they are getting taller and older and not as squishy any more. This doll has not been made to comission so she may be with me long enough for me to take some proper photos of her and for me to get to know her a little. I still need to make some kind of warmer layer for her, and I’m rather hoping to take her to the Yarn Festival here in Edinburgh in a few weeks time as there will be plenty of textile-lovers happy to meet her there. Perhaps she will be properly dressed by then. Astrid, why don’t we go out and play? The sun is shining and spring is in the air. I know the wind blows your hair about, but that’s alright. Can you see the bulbs growing? If you’re too low down you can climb up for a better view, I won’t let you fall. This one is called Winter Flowering Jasmine, can you see the first leaves unfurling? No, we shouldn’t climb through the fence. That’s the neighbour’s garden. Yes, we can go inside and brush that wind out of your hair. Then we can read a book together.